Finally a camber gauge designed for karters! The Accucam camber gauge is a specially designed gauge with left and right precision ground camber vials. 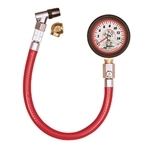 This camber gauge is small in size and uses a positive lock adapter which ensures a more precise and reapeatable read. A must have for the serious racer!